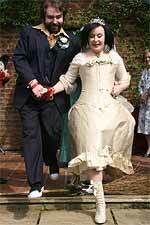 Handfasting is an interesting Pagan custom that pre-dates the Christian church’s involvement with marriage. Reverend Helen J. Carol Thompson in “The History of Handfasting” states that, “In the British Isles, handfasting was the old pagan ritual of marriage and it remained legal in Scotland all the way up to 1939.” In a typical church marriage ceremony, the couple pledge themselves to each other as a life-long commitment. Handfasting, however, is somewhat different. In this case, a couple may choose to be to be “married” for a certain period of time, which is agreed on between one another before the ceremony. For example, a couple may agree to be wed for a year and a day (a popular choice at the time), and once the year is up, they may choose to renew their commitment to one another—or go their separate ways. The ceremony itself was historically a very personal ritual for each individual. The location choosen for the ceremony was usually outdoors in a wooded area, near a glen or a lake, or in a field… so long as it was close to nature. A family member, close friend or High Priestess would preside over the ceremony. The entire proceedings would begin with the bride and groom thanking their guests for coming. The person officiating the wedding would then say a few words of welcome to the guests and, if it were a Wiccan ceremony, start off by calling upon the elements of nature, along with the particular deities that the couple worshipped asking them to come and bear witness to the proceedings of the union. The couple then each presented a hand to the officiate so that he/she may bind them together with one or more cords or ribbons. This was to signify that they were joining together through love and free will. Once tied, the couple would turn to face one other and each would speak their vows directly to the other. They would also ask for the blessing of the union, and finish by stating how long they have agreed to be bound to one another. Jumping the Broom—Most people believe that jumping the broom is a tradition only practiced by enslaved people in America when they were not allowed to marry in public. But according to Amy Hicks in her article “Jumping the Broom” "Another view of this tradition is that it began in West Africa...The person who jumped the highest (usually the man) became the head of the household...Other cultures that have or had jumping the broom ceremonies include Wiccans, Roma, the Welsh, and gypsies." Guests would hold a broom close to the ground and the couple would jump over it. This was to symbolize their jumping from an old life to a new life and to ensure fertility for future children. Most of the above article is an excerpt from the ebook: How to Create a Beautiful Medieval Wedding by Rose Smith. Her website, http://www.wedthemes.com/ is an excellent resource for couples looking for unique ideas when planning a themed wedding. Edited by Gael Stirler. See more photos of Tamsyn and Joe's wedding in Barnsdale and more photos of Brad Sprauer's wedding in Scotland. If you want to add this article to your list of favorites or email it to a friend, please use this permanent URL, https://stores.renstore.com/-strse-template/0805A/Page.bok. Permission is granted by the author to quote from this page or use it in handouts as long as you include a link back to Renstore.com.